The air fryer is a favourite around here. It’s one of my most used appliances, after the Instant Pot and my stand mixer. Being able to eat fried-like foods without the oil and guilt? Yes please! You don’t need the fanciest air fryer. Mine is probably the simplest boring one around but it does the job. From fries to veggies, it’s perfect for everything. It also makes the best wings with no additional oil needed. The secret to a great wing is to coat it with some corn starch before cooking. That’s what gives it the crunch. 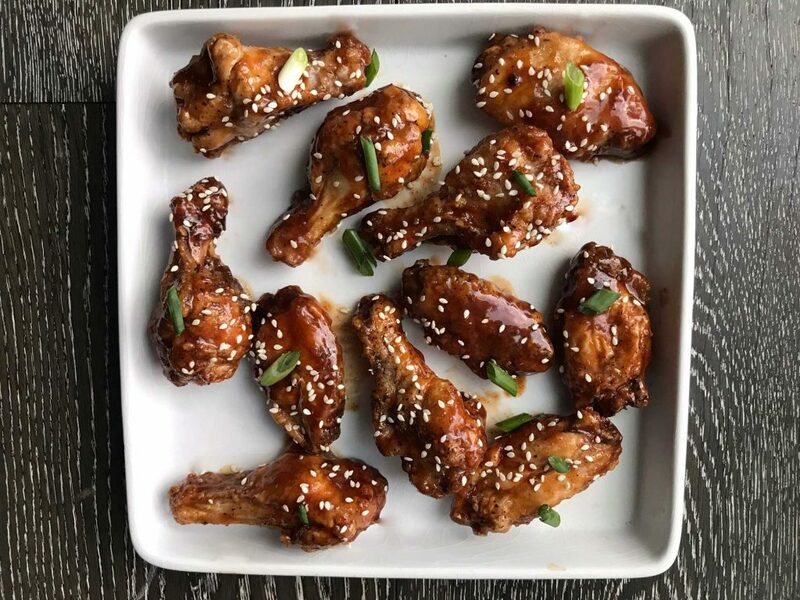 Just make the wings in the air fryer and toss them in the sauce. It’s really quite easy. Add some sesame seeds and green onions as a garnish and you’ve got yourself a delicious looking and tasting dish. The marriage of teriyaki sauce and hot sauce is definitely a winner. The sweetness of the teriyaki with the heat from the hot sauce works so well. For the teriyaki hot combination, just use your favourite sauces. The teriyaki one should be a thick one, that when the wings are tossed in it, it wants to hold on. My favourite is the Golden Dragon Thick Teriyaki sauce. It’s been a fave of mine for years. For the hot aspect, Frank’s Red Hot or Tapatio are always great options. 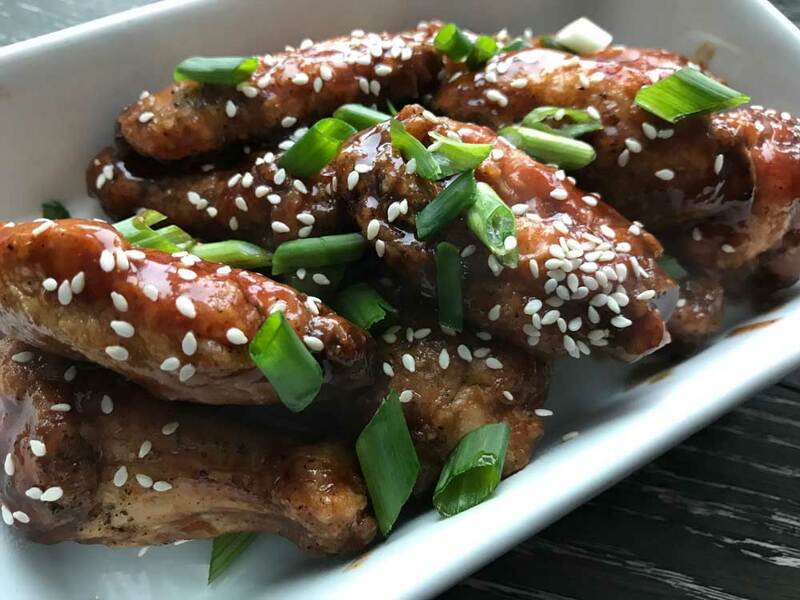 If you want wings, this will definitely satisfy any craving you have. Perfect for a party or to watch the game. In a bowl with a lid, add the wings, salt and pepper and cornstarch. Put on the lid and give it a big shake, ensuring that the cornstarch coats all the wings. Place in the basket of your air fryer and cook at 400 degrees for 25 minutes. Give the basket a shake half way through. Add the sauces to a bowl with a lid. Throw the wings into the sauce and give it a shake. I'm such a sucker for wings! And I honestly can't remember the last time I used my air fryer. Which, in my mind, would result in a "healthier" wing, right? Haha ;) I can't wait to try this! 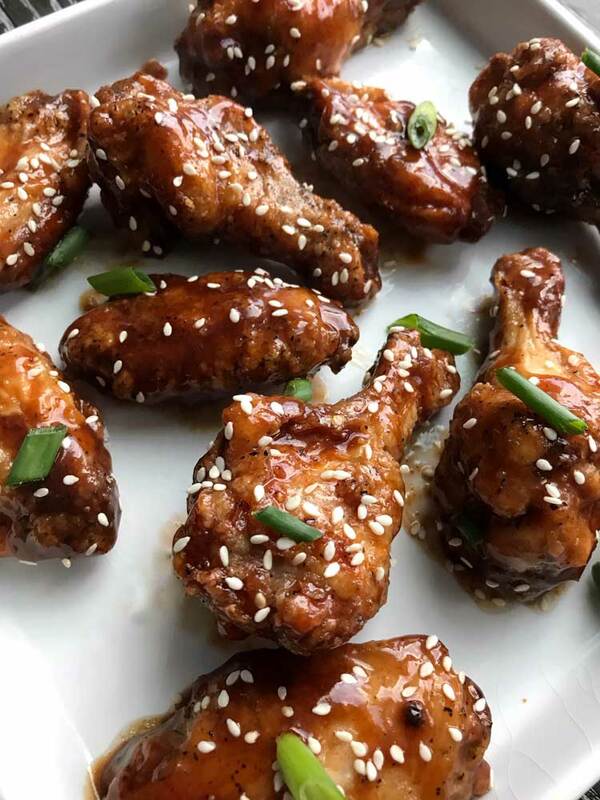 I used chicken wing drummets only (they are usually larger and meatier. For the “thick’ teriyaki sauce, I used Kikomans Marinade and Glaze, then Louisiana brand hot sauce. This is my family’s favorite wings recipe. The hot sauce reduces the sweetness of the honey/pineapple glaze— perfect flavor!